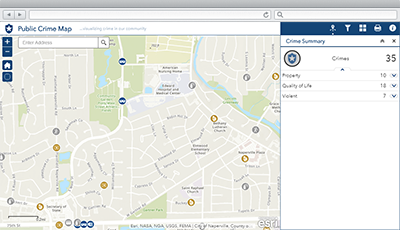 Public Crime Map is a configuration of Web AppBuilder for ArcGIS that can be used by the general public to view recent crime activity in, and around, a given location. Public Crime Map can be used to search for crime by type and date and time of crime. As a result, it helps the general public understand crime patterns in a community and participate in activities that help reduce crime in the community. To deploy Public Crime Map with the ArcGIS Solutions Deployment Tool requires specific software. To manually deploy Public Crime Map in your organization requires specific software. Application Public Crime Map An application used by the general public to view recent crime activity in, and around, a given location. Map Public Crime Map A map used in the Public Crime Map application to view recent crime activity in, and around, a given location. Feature layers Crimes A feature layer that stores actions or omissions that constitute an offense that may be prosecuted by a government agency and is punishable by law. Crimes_public A public feature layer view of actions or omissions that constitute an offense that may be prosecuted by a government agency and is punishable by law. Below are the release dates and notes for Public Crime Map. An updated crimes layer and associated layer view. Support for ArcGIS Pro 2.2 and ArcGIS Enterprise 10.6 and 10.6.1.